A WHOLE GENERATION of Syrian children risks being lost amid the country’s spiralling civil war, the UN children’s agency has cautioned today, saying it was in urgent need of funds to address the crisis. “As the crisis in Syria enters its third, tragic year without any end in sight, the risk of a lost generation grows every hour, every day and every month,” UNICEF spokesman Patrick McCormick told reporters. “We cannot afford to lose any more time. We certainly cannot afford to lose another year. We risk creating a generation of children who have seen, or know, only fighting, and may well end up perpetuating that cycle of violence,” he warned. The scarring of an entire generation could have dire consequences beyond Syria’s borders, in a fragile region prone to violence and civil strife, McCormick said as UNICEF published a report two years to the day after the conflict began. 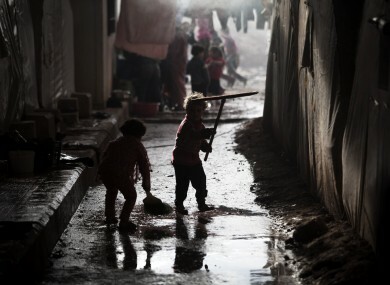 The Geneva-based agency pointed out that nearly half of the four million in dire need of aid inside Syria are under the age of 18, and 536,000 of them are children below the age of five. Some 800,000 children under the age of 14 have meanwhile been internally displaced by the conflict, representing a sizable number of the estimated two million displaced Syrians. Children also represent over half of the one million Syrian refugees, most of whom have fled to neighbouring Jordan, Lebanon, Turkey and Iraq. “Millions of children inside Syria and across the region are witnessing their past and their futures disappear amidst the rubble and destruction of this prolonged conflict,” UNICEF chief Anthony Lake said in the report. The agency stressed that it was severely underfunded to help all the children in need. “UNICEF is committed to keeping Syria’s children from becoming a lost generation. None of us can afford that to happen. But they are on a precipice right now,” said McCormick. “UNICEF needs urgent funding” to continue its work, he said. “The funding has been extremely disappointing on Syria compared to other emergencies,” he added. UNICEF said it so far had received only 20 per cent of the $195 million (€150 million) it had appealed for to help children and women affected by the crisis in Syria and in neighbouring countries through the end of June. The agency warned that without more funds, it would soon need to scale back things like providing clean water, measles and polio vaccination campaigns, life-saving neo-natal care and emergency medical care. Children, it cautioned, were especially vulnerable in the midst of an ever more ruthless civil war, that began with a brutal crackdown by the Bashar al-Assad regime on protests that erupted in March 2011. Children inside the country are among 70,000 people the UN estimates have been killed there during the past two years of escalating violence, UNICEF pointed out, adding that children have also been maimed, exposed to sexual violence, torture, arbitrary detention and recruitment as soldiers. “Countless children suffer from the psychological trauma of seeing family members killed, of being separated from their parents and being terrified by the constant thunder of shelling,” Lake said, adding that access to clean water, adequate sanitation and health care is becoming increasingly scarce. One in five schools in the country have been destroyed, the report showed. “All around them, their dreams and opportunities for the future are being lost,” Lake said. Email “Whole generation of Syrian children could be lost, says UN”. Feedback on “Whole generation of Syrian children could be lost, says UN”.